Both Russia and Georgia have hurled charges of genocide and ethnic cleansing at each other in the aftermath of the five-day war in the Caucasus. While no substantial evidence of such atrocities has yet emerged, the toll of the fighting and ensuing lawlessness has exacerbated ethnic animosities; once neighborly Ossetians and Georgians are now implacable enemies even as they cope with life as refugees. At the emergency hospital in Vladikavkaz, the capital of North Ossetia, every room was filled with a wounded man or old person from Tskhinvali, the capital of South Ossetia. They told stories of bombs and artillery turning their houses and courtyards into fiery traps, of perilous rescues, of the fear that they have nothing left to return to. Most have expressed confusion about why Georgia would attack and felt that they could never live with Georgians again. Those who continued to feel that their Georgian relatives, neighbors and friends were good people nevertheless believed that the Georgian leadership were stooges of the U.S., which was bloodthirsty and corrupt. They have nicknamed the ideology of President Mikheil Saakashvili, leader of Georgia, "Saako-fascism." The stories are reversed in Tbilisi, capital of Georgia, where lurid posters portray Moscow's leaders Vladimir Putin and Dmitri Medvedev as Hitler and Mussolini and show a gluttonous Russia devouring Georgia, asking "Who's Next?" 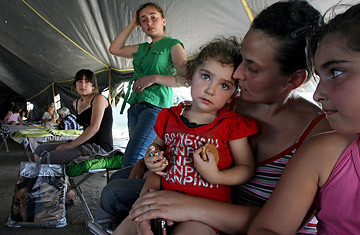 Givi Tadiashvili fled from a village near Tskhinvali, where he said looters showed up after the bombing ended, demanding water and wine to drink. They made his neighbor drink first, to make sure the liquids were not poisoned. Three villages were burned near his home. "They do it to show their aggression. It's their revenge not to let us go back," he says. Another man, taking shelter at an old school in Tbilisi, says he left his sick mother behind in her home in his native village and is now worried she is going to be burned alive. He says he has heard reports since he left that the whole village was torched. "If they burn the house, she will die inside," says the man, Tamaz Zangaladze, 55, who adds that he saw five friends killed in the conflict. A South Ossetia government official speaking on condition of anonymity admitted that Ossetians had started murdering the old people who had remained to protect houses, possessions and livestock. TIME has not been able to verify that claim. The Russian military, which invaded after Georgia tried to retake the breakaway region of South Ossetia, has not allowed Western journalists to leave the buses that have been allowed through the destroyed areas. But Russian journalists have been given free access to the area and allege that ethnic Georgian property has been targeted. Explains Dmitri Steshin, a reporter for Komsomolskaya Pravda, a Russian daily newspaper: "[The military doesn't] want you to see that all the Georgian homes have been burned down. It's as simple as that." Says Ludmilla Alexandrova, 50, a resident of Tskhinvali: "I don't think the Georgians will ever return." She will not miss them. Alexandrova has organized a water-distribution point for her neighborhood  an area, like the rest of the capital, without water, gas or electricity. The Georgians, she says, "caused all of our problems. They turned off our water and gas in the past." The situation has been made worse by a second wave of violence after the Russian intervention, carried out not by soldiers but by looters, including some local Ossetian militias as well as Chechen and Cossack gangs from Russia. It has laid further waste to the region, say refugees and human rights workers. "This conflict has been a disaster for civilians," Rachel Denber, Europe and Central Asia deputy director at Human Rights Watch, said in a statement on Monday. She said there was an urgent need for fact-finding missions to establish the facts of the conflict and to "urge authorities to account for any crimes." She added, "Russia should prevent any further militia attacks and allow humanitarian aid to reach the hundreds of vulnerable civilians still in the area, including many elderly." Some local Ossetian officials with the breakaway government have said the looting is justified as retribution for the Georgian attacks on Ossetian positions that provoked Russia's military intervention. The breakaway territory's nominal president, Eduard Kokoity, a former wrestler, when asked whether ethnic Georgians who had been living in South Ossetia would be allowed to return, told the Russian daily Kommersant that "we have no intention of letting them in there." Several Russian officials, confronted by aid officials with evidence of widespread looting in the occupied Georgian city of Gori, said the area is not their responsibility because it is legally Georgian territory. But human rights monitors reject that argument. "This area [now occupied by Russian troops] is effectively under Russian control. The Georgian military is not there, so Russia has a responsibility to protect civilians there," says Giorgi Gogia, a researcher for Human Rights Watch in Georgia. In Tskhinvali, however, locals say the Russian presence has helped re-establish security. "When the Russian army came," says Misha Masurashvili, a gangly 17-year-old, "the bandits ran off." The death toll from the war and its aftermath has yet to be determined  making allegations of genocide impossible to investigate. No mass graves, for example, have yet to be discovered. Russia has said that Georgian government troops and militia had begun ethnic cleansing when they tried to retake the breakaway region, and South Ossetian Interior Minister Mikhail Minzayev has estimated 2,100 dead. (Western journalists in the area have come up with rough estimates of 500 to 600 dead.) Gogia said the South Ossetian and Russian claims of more than 1,000 dead are "inflated, exaggerated. There is no way to say a genocide take place. If there were 2,000 dead, we would have 6,000 wounded, and we have seen nothing like that." Meanwhile, Minzayev denied there had been acts of ethnic cleansing against Georgian villages, saying, "There has not been one example of this activity in South Ossetia." Minzayev said the army is still finding bodies in basements  sometimes just bones because of fires. An estimated 95% of the buildings in Tskhinvali have suffered fire damage as a result of war and looting. The only houses that haven't been burned are the ones that were still under construction and didn't contain anything valuable to steal. "People are burying their dead in the courtyard of their homes and in their clan cemeteries in the mountains," Minzayev says. Priests at Mary Mother of God church, a South Ossetian congregation in Tskhinvali, said they had carried out more than 100 funerals in a three-day span. "But we have carried out many more than that outside of the church, in people's courtyards," one said. "When the body begins to smell, they are not allowed to have a service in the church itself." He added, "I've lost count of how many we've buried."